Random House Trade Paperbacks, 9780812976175, 224pp. “Character is destiny,” wrote Heraclitus–and in this collection of four unforgettable stories, we meet people struggling to understand themselves and the unexpected turns their lives have taken. In “Accountant,” a quintessential company man becomes obsessed with the phenomenal success of a reckless childhood friend. “Batorsag and Szerelem” tells the story of a boy’s fascination with the mysterious life and invented language of his brother, a math prodigy. In “City of Broken Hearts,” a divorced father tries to fathom the patterns of modern relationships. And in “The Palace Thief,” a history teacher at an exclusive boarding school reflects on the vicissitudes of a lifetime connection with a student scoundrel. A remarkable achievement by one of America’s finest writers, this brilliant volume reveals the moments of insight that illuminate everyday lives. 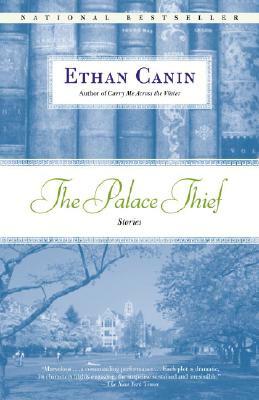 Ethan Canin is the author of seven books, including the story collections Emperor of the Air and The Palace Thief and the novels For Kings and Planets, Carry Me Across the Water, America America, and A Doubter’s Almanac. He is on the faculty of the Iowa Writers’ Workshop and divides his time between Iowa and northern Michigan.